As with many new Apple products – mainly due to high demand – the shipment of Apple Watch has been the victim of delays. The new smartwatch from Apple was sold out even before it was available in Apple Stores, causing Apple to have to limit in-store pick-ups to just one per user. Only select Apple Watch models were shipped on time. If you have been waiting for an Apple Watch with Link Bracelets, your wait is finally over. 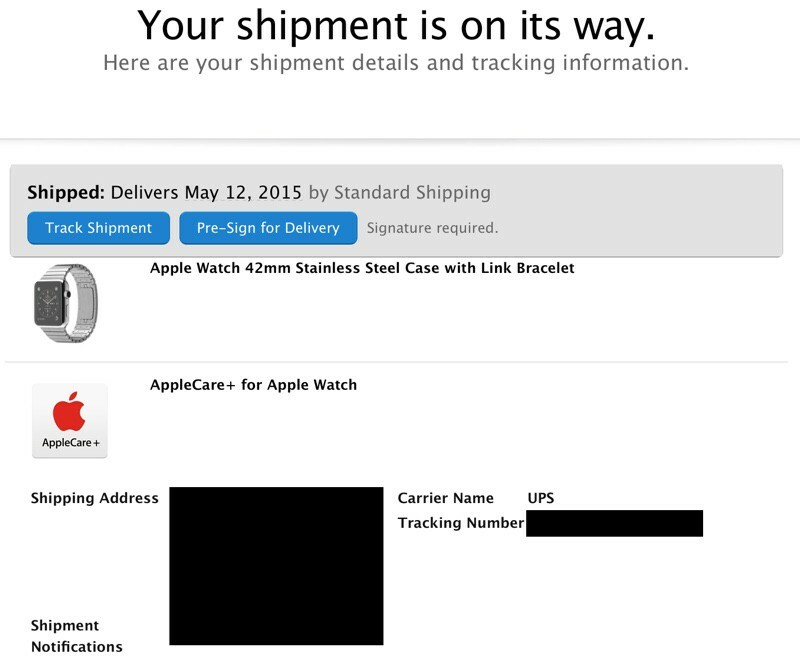 The first orders of Apple Watch with Link Bracelet are beginning to ship out to customers as early as yesterday. You will see your credit card charged – if not already – and you will find a shipping information in your inbox; both are great signs that your Apple Watch will be coming soon. Keep in mind that the shipments are only for the stainless steel version of the Apple Watch, particularly those who ordered it with the Link Bracelet configuration. The black version of Apple Watch is yet to be shipped to customers for obvious reasons. The stainless steel Apple Watch with Modern Buckles and Leather Loops are also not shipping out yet. The Space Black Apple Watch with any configuration, particularly with the Link Bracelet is scheduled to be delivered in as early as June, although Apple is trying to crank up its production lines to speed up delivery. Those of you who are still waiting for your Apple Watch to be delivered will still have to wait for a little bit more. The same can be said for other configurations of the stainless steel model. It is not clear whether the Modern Buckle and Leather Loop versions of the Stainless Steel Apple Watch will ship soon. Reports said that you can expect delivery as soon as next week or the week after, but neither of these reports can be confirmed yet. Manufacturing process may be to blame for the delays here. The Classic Buckle, Milanese Loop and Sport Band for the smartwatch, which are significantly easier to make, are not seeing shipment delays so far. The Link Bracelet, for instance, includes links that take more than nine hours to cut. Each bracelet needs to be put together carefully through a very meticulous production process. Based on everything that has been outlined so far, what do you personally think about these developments? Have you had your Apple Watch delivered? We would like to know your first impressions! Be sure to leave your stories in the comments section below and let us know what you think.